Embrace the World will take place during Parents Weekend on Saturday, October 20, 2018 at 6:00 p.m. in the FAC. 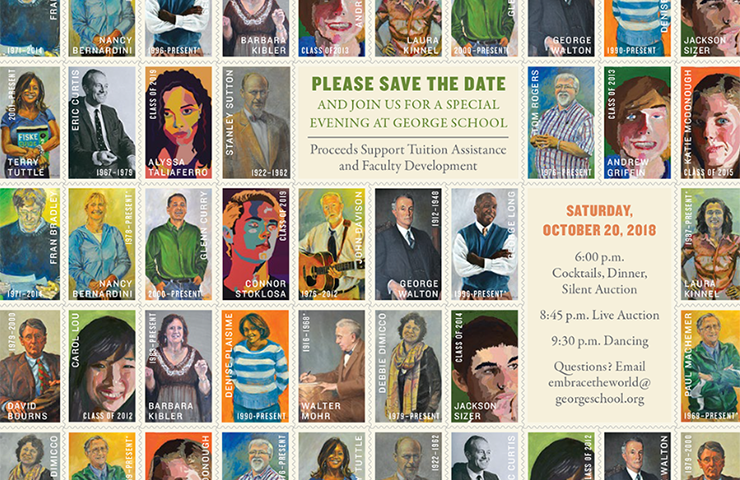 George School’s quasquicentennial celebrations will conclude this fall when the school hosts Embrace the World, a dinner, dance, and auction. More than half of George School students receive tuition assistance and fundraising is crucial to continue that effort. “GS has already gone beyond the limits of what we can do in terms of financial aid. Anything more must come from fundraising,” said Doug. The Fitness and Athletics Center (FAC) will be transformed into a cross-cultural wonderland for this special evening and a range of international cuisines will be offered. The entire George School community is invited to attend. Embrace the World will take place during Parents Weekend on Saturday, October 20, 2018 at 6:00 p.m. in the FAC. The event is open to all alumni, parents, faculty, staff, and friends of the school. Tickets will go on sale on or around August 20. Sponsorship and advertising opportunities are available. To donate, volunteer, or to learn more information please visit the event’s webpage or email embracetheworld@georgeschool.org.